PHOTO CAPTIONS: 1. 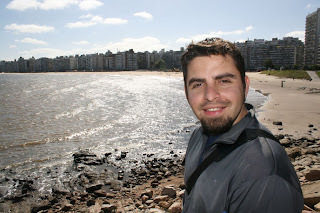 Gabriel at La Rambla in Montevideo, 2. 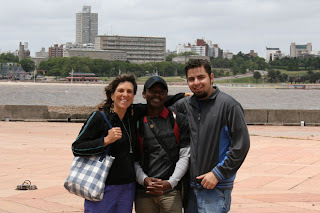 Gabriel, Andre and me near Rio de la Plata, 3. 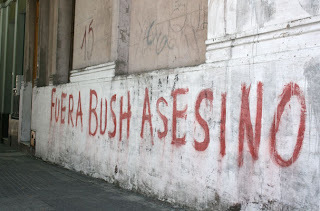 At the National Palace, 4. Puerto Carretas Shopping Mall, 5. Gabriel thrilled to find Mexican food, 6. Andre and Gabriel became fast friends, 7. 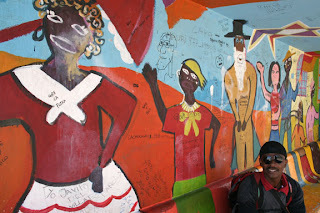 An Afro-Uruguayan mural, 8. anti-Bush graffiti, 9. An example of classic architecture. My friend Gabriel left Santa Cruz after three years, so he could continue his studies at the university in Guadalajara, Mexico, not far from his hometown of Limon. Now he's finishing up a semester abroad in Montevideo, Uruguay. Andre and I arrived in town just after exams, so Gabriel's been able to show us around. Gabriel keeps talking about how poor Uruguay is, but it's hard for me to see. Everyone looks healthy, happy and white, they dress nicely, they're out shopping and enjoying themselves. Gabriel compared car ownership to make his point. Very few students at the university in Montevideo own cars, while Gabriel was one of few in Guadalajara who doesn't. But Montevideo has an excellent bus system and I'm glad there are fewer cars. The horse carts that pick up the garbage aren't just quaint, they're quieter and ecologically superior to our trash trucks. The Hotel Hispano where we've been staying is a 5-minute walk to Gabriel's river view apartment which he shares with three other Mexican students. Five minutes the other direction is the Ciudad Vieja, or old town. Everywhere you look are gorgeous historic buildings, as beautiful as anything in Buenos Aires, but most desperately need to be renovated. 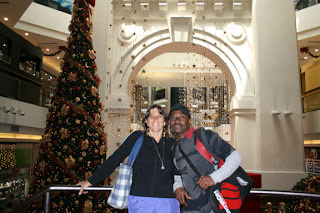 I love walking around with a local guide like Gabriel. So far we've seen the National Palace, Plaza Independencia, Rodo Park with its statue of Confusius, the Ramblas walkway along the Rio de la Plata waterfront, and the U.S. Consulate which faces the Rambla. We ate steak in the Mercado del Puerto, went to the Sunday street fair (flea market), Punto Carretas Shopping Mall, a beach-side boardwalk, a German photo show, and watched viejitos (old folks) dancing tango in the plaza. 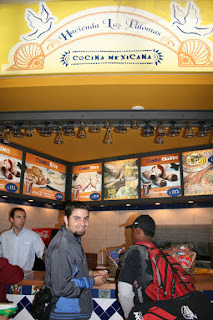 One of the highlights for both Gabriel and Andre was Mexican food in the Plaza de Comida (food court) in the American-style Punto Carretas Shopping Mall. Andre had never tasted Mexican food before, but discovered that he's nuts for chicken fajitas. He also loves the hot sauce. The food in Haiti and Dominican Republic is somewhat spicy, but nothing like the Mexicans who put chile on top of chile, as one friend from Honduras likes to say. Here in Uruguay, they don't use spice at all. When Andre asked for something picante they handed him black pepper. Gabriel had fajitas too and kept telling me how happy he was. He'd been to that shopping center several times before, but never noticed the Mexican restaurant. Friends had warned him back in August when he first left for Uruguay to bring his own Salsa Tapatio with him, but he regretted that he hadn't listened. When the Mexican Consulate in Montevideo wanted to celebrate Mexican Independence Day on 16 de septiembre, they purchased frozen tortillas for $4 a dozen and small cans of jalapeños for $3 each. Gabriel's Uruguayan friends who he invited to the fiesta couldn't handle the extra mild salsa that was prepared especially for them. Luckily, when a childhood friend came to visit from Limon, Mexico, he brought a big care package of Mexican sweets, canned chiles and salsas, and even smuggled in some fresh jalapeños by wrapping them in his socks at the bottom of his suitcase. Today was consulate day. 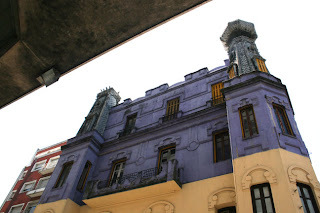 We went to the Canadian consulate, but we were told to go the one in Buenos Aires because they don't issue visas here. 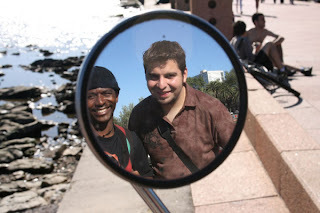 At the Chilean consulate we found out that Andre's friends were right and the Chilean website was wrong: Haitians don't need visas to visit Chile, which is great news. Andre needed a Bolivian visa and got it on the spot. Now all we need are yellow fever vaccinations and certificates in order to enter Bolivia and to get back into Brazil afterwards. More good news: I was able to change our return flights from January 3 to January 11 from Sao Paulo to Santo Domingo. That means we'll have holiday time with my cousins who are visiting Gannon in Buenos Aires AND we'll be able to travel to Salvador de Bahia and Rio in Brazil before leaving South America. There wasn't even a service charge to make the changes. We'll arrive around midnight, pick up a rental car and go stay at Junior's house. Then Maya's dad Daniel will arrive from California the next day and we'll pick him up at the airport and begin our vacation together. January 16 is the first anniversary of Maya's death and it's really important that Daniel and I will be together that day. somewhere besides Santa Cruz.